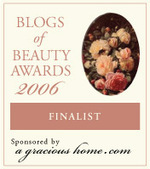 The fourth finalist in this category is a blog I hadn’t encountered before: Enjoy the Journey. I have just spent most of my early-morning blog-writing time on a thoroughly enjoyable exploration of Lindsey’s site. Great essay on motherhood near the top of the page. Voting instructions can be found at A Gracious Home. There are many other fine blogs in the various categories. If you had any free time left you can kiss it goodbye now. Many thanks to the person who nominated me, whoever you are! I enjoy these contests because I find out about so many new blogs. I hadn’t read Higher Up and Farther In either. I have been reading Just Enjoy the Journey. Lindsey is a lot of fun. I think we should just pool the votes and declare a group winner! Congratulations, Melissa. I enjoy reading you blog quite often. Thanks you sharing your time so freely. Congratulations!!! That’s exactly how I found you!! You have a LOVELY blog! !